In my heavy grief over the election results, I was inspired by a German children's song "Lantern lantern stay alive. It's dark outside but my light keeps shining." I compiled hundreds of people's answers to the question "what do we do now?" 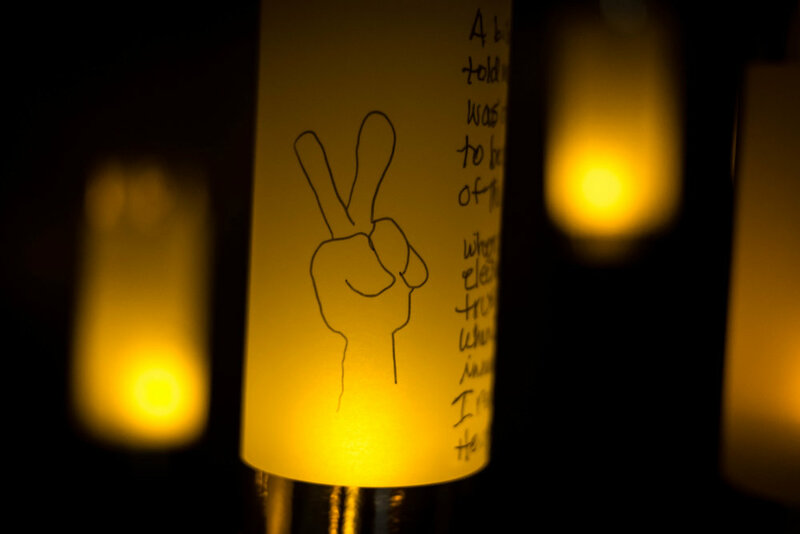 and have made an installation of lanterns that travels from venue to venue. In my heavy grief over the election results, I was inspired by a German children's song "Lantern lantern stay alive. It's dark outside but my light keeps shining." I compiled people's answers to the question "what do we do now?" 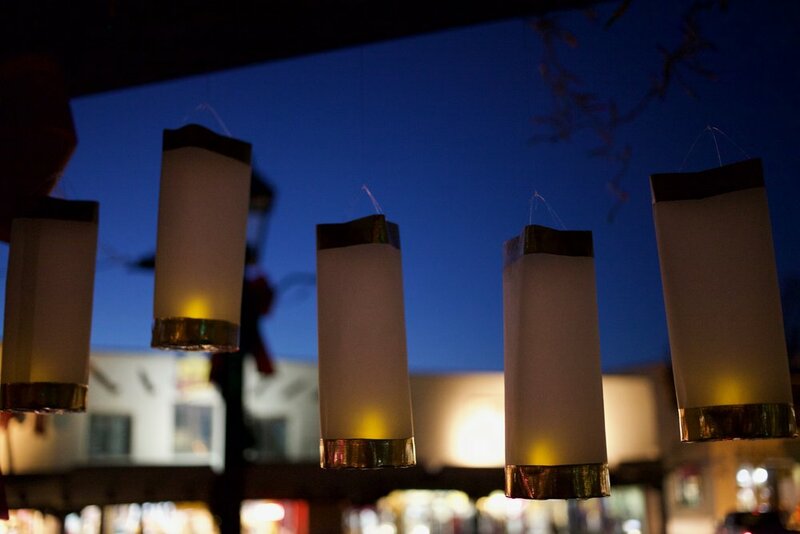 and made an installation of lanterns at the Helene Wurlitzer Foundation in Taos, New Mexico. In my heavy grief over the election results, I was inspired by a German children's song "Lantern lantern stay alive. It's dark outside but my light keeps shining." I compiled people's answers to the question "what do we do now?" and made an installation of 250 lanterns that travel from venue to venue. In my heavy grief over the election results, I was inspired by a German children's song "Lantern lantern stay alive. It's dark outside but my light keeps shining." I compiled people's answers to the question "what do we do now?" and have made an installation of lanterns at 3-Squared Gallery in Chelsea, Manhattan during the presidential inauguration 2017. In my heavy grief over the election results, I was inspired by a German children's song "Lantern lantern stay alive. It's dark outside but my light keeps shining." I compiled people's answers to the question "what do we do now?" and have made an installation of lanterns at the Helene Wurlitzer Foundation in Taos, New Mexico and the Taos town plaza. In my heavy grief over the election results, I was inspired by a German children's song "Lantern lantern stay alive. It's dark outside but my light keeps shining." I compiled people's answers to the question "what do we do now?" and have made an installation of lanterns at the Helene Wurlitzer Foundation in Taos, New Mexico and the Taos town plaza. I made 120 lanterns. In my heavy grief over the election results, I was inspired by a German children's song "Lantern lantern stay alive. It's dark outside but my light keeps shining." I compiled people's answers to the question "what do we do now?" and have made an installation of lanterns at the Helene Wurlitzer Foundation in Taos, New Mexico and the Taos town plaza. I made 120 lanterns. Here is the installation in progress. In my heavy grief over the election results, I was inspired by a German children's song "Lantern lantern stay alive. It's dark outside but my light keeps shining." I compiled people's answers to the question "what do we do now?" and have made an installation of lanterns at the Helene Wurlitzer Foundation in Taos, New Mexico. In my heavy grief over the election results, I was inspired by a German children's song "Lantern lantern stay alive. It's dark outside but my light keeps shining." I compiled people's answers to the question "what do we do now?" 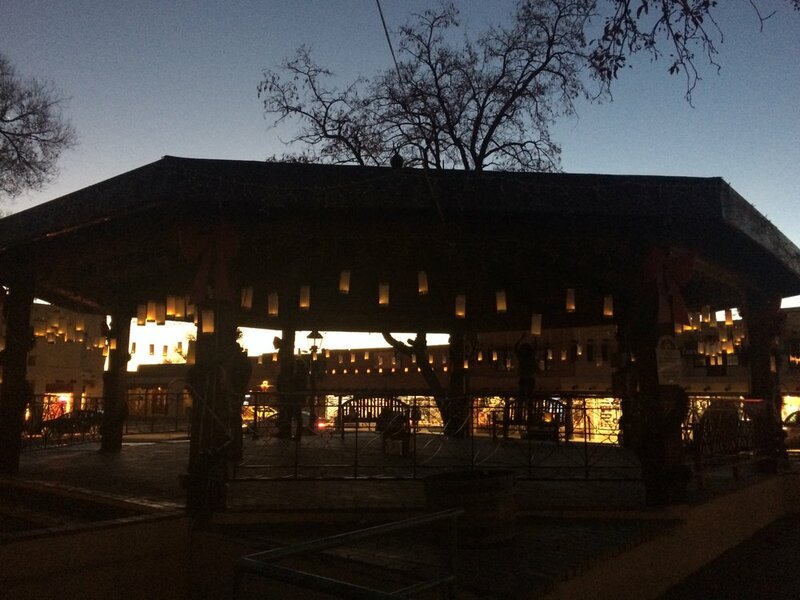 and have made an installation of lanterns at the gazebo in the town plaza in Taos, New Mexico.